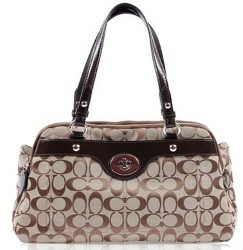 Ready for a chance to win another Coach purse? 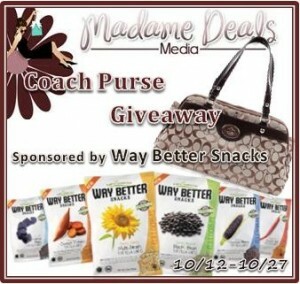 We are giving away a Penelope Coach purse sponsored by Way Better Snacks! Tired of packing on the pounds while snacking on those delicious but unhealthy potato chips? Way Better Snacks are a great alternative for a healthy snack! Read our review below and watch the Bandit taste test them! Way Better Snacks are sprouted tortilla chips that are a WAY Better Snack choice. They are Non GMO Project Verified, Certified Gluten Free, Kosher and Vegan. Made with Whole Grains and seed sprouting they not only taste good but they are also good for you. We had the opportunity to taste test the six different varieties. We have tried them alone, with dips, and salsa. Like to try some of these awesome snacks for yourself? you can find Way Better Snacks on their Website as well as Facebook, Pinterest and Twitter! A girl can never have too many handbags! Enter to win a Penelope Coach Purse. The giveaway will run from 10/12 12:01 am EST – 10/27 11:59 pm EST and is open to US residents only. I like the fact that they are using sprouted whole grains and seeds in they’re chips! I like that they are made from beans, whole grains and no salt-not to mention all the other good things-My family is full of bean eaters-and the more products I find made from beans the more excited we get. WAY BETTER!! Whole Grains and seed sprouting are Way Better!!!!!! Me winning coach bag, Way Better! !